Last week could've gone better for Activision Blizzard (ATVI). The country's largest video game company put out the highly anticipated Diablo III last Tuesday and there was no shortage of buyers. It was Amazon's most pre-ordered PC game of all time. The problem started when diehard gamers finally began trying to play the game. Server outages rocked the gaming community, and folks who had paid $60 for a game that requires online connectivity -- even in single-player mode -- turned against Activision Blizzard when its servers went down. Negative reviews knocked the previously encouraging game ratings across gamer websites. Things were supposed to get interesting this Tuesday. The game was supposed to launch an "auction house" feature in which gamers could buy and sell the virtual goods that they collect from the game. Yes, there will be real money to be made and spent here. Activision Blizzard will provide the marketplace and collect 15% of any transactions. Well, last week's debacle threw a wrench into the company's plans. Instead of launching the auction marketplace this week, Activision Blizzard will roll it out next week. This will be a week for the company to win back the trust of early buyers of the game who suffered several hours of server outages. Memorial Day weekend will be a busy one at the corner multiplex. It has already been a strong year for exhibitors so far thanks to a feast at the box office from The Hunger Games in March and the record-setting performance of The Avengers earlier this month. After a disastrous 2011, we're finally heading back to the movie theater again. The big draw this upcoming holiday weekend will be Sony's (SNE) Men in Black 3. Sequels of big movies typically do well. Even though it's been a long stretch of time since 1997's Men in Black and 2002's Men in Black II, moviegoers are apparently still pretty excited about the franchise. It's one of the seven movies contending to be this summer season's biggest hit. Several publicly traded jewelry retailers will step up to deliver their quarterly reports this week. Tiffany (TIF), Zale (ZLC), and Signet (SIG) will be reporting. The name Signet may not ring a bell, but you've almost certainly heard the catchphrases of some of it chains. Signet is the company behind Kay "Every kiss begins with Kay" Jewelers and Jared "He went to Jared" The Galleria of Jewelry. Jewelry is a seasonal indulgence, and this should be a strong quarter for all three companies -- after all, the three previous months include Valentine's Day. These have been hard times for the computer industry. Consumers are realizing that you don't need computers or laptops as much when a smartphone or tablet will suffice. Dell (DELL) and Hewlett-Packard (HPQ) are the country's two largest computer makers, and both companies are laggards in those gadget categories. HP's stock hit a 52-week low last week as reports were confirmed that the tech bellwether would be laying off as many as 30,000 employees. It's a bit of a surprise since HP has actually been gaining market share over the past year. The concern -- of course -- is that gaining market share in a pie that may be shrinking in size is still a problematic situation. Both Dell and HP will be reporting this week. Given the gloomy backdrop, investors shouldn't be surprised to find that analysts see both companies posting declines in profitability. 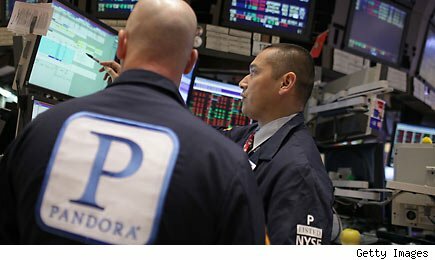 Pandora Media (P) is one of the more interesting companies discussing its quarterly financials this week. The company behind the fast-growing music discovery website checks in on Wednesday. Popularity isn't a problem at Pandora. The streaming service recently revealed that its users logged in with 1.06 billion listening hours last month, an 87% increase over April of last year. Its share of the total U.S. radio listening market has nearly doubled to 6% over the past year. The problem at Pandora is its ability to monetize the traffic generated by its 51.9 million active users, since most of those are free accounts that put up with ads for their streams. We'll find out how Pandora is doing on that front come Wednesday. Longtime Motley Fool contributor Rick Munarriz does not owns shares in any of the stocks in this article. The Motley Fool has sold shares of Sony short. The Motley Fool owns shares of and has written calls on Activision Blizzard. Motley Fool newsletter services have recommended buying shares of Activision Blizzard and Dell; creating a synthetic long position in Activision Blizzard; and shorting Tiffany.